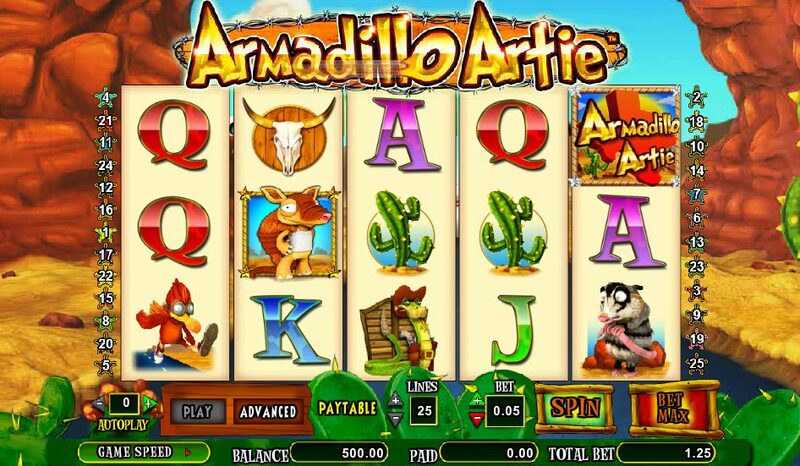 “Is this the way to Armadillo?” Tony Christie crooned (sort of) in his classic ‘70s hit, and while that may be a terrible pun to kick off proceedings, the Wild West-themed slot from Amaya, Armadillo Artie, certainly lays on the comic features. 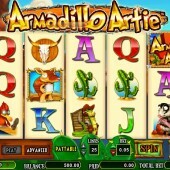 Set in a dry and dusty backwater of Texas, this 5-reel, 25-payline online slot from the leading developer sees you follow our hard-shelled hero. Our Artie's mission is to battle against his snake nemesis, a timid raccoon, and a vulture but you will also find cacti and skulls on the reels. Watch Out! Artie Gets Wild! Artie Armadillo acts as the game’s Wild, appearing on Reels 2 to 5, and substituting for all regular symbols other than the Scatters. He also expands horizontally, giving you even more chances to win. Look out for the first Scatter –the bowling ball Bonus icon – as two or more of those on reels 2 to 4 triggers the arcade bonus game. Here you have to send a bowling ball down the lane via left, right and up arrows, with a total win of 30x your total bet up for grabs. The Sheriff’s badge Scatter, meanwhile, will trigger a free spins round when hitting three on Reels 2 to 4. It’s pretty hard to hit, mind, but when it does you’ll instantly get 10 free spins. Not only that, but you can trigger the Bowling Bonus game during the free spins round – result! While I found the bonus games a little tricky to hit, the presence of expanding Wilds was a nice touch, and the overall jokey themes was great. Interactive bowling game are everywhere in slots land, and you should think about checking out Microgaming’s funny take on the bowling slot, Alley Cats, if this has hit the right spot. Elsewhere, there’s Bob’s Bowling Bonanza, a more bolshy bowling-bound behemoth, also from Microgaming, which is a great big throwback to 1950s America in a slot.